The base 2018 Mazda 6 and its manual shifter. The Mazda 6 is a good car, even if many buyers ignore the existence of sedans these days, and it’s long come with the option for a manual transmission—even if the stick is currently relegated to the car’s lowest trim. But citing dealer order guides, CarsDirect reports that the manual will be no more in 2019. We have not seen the order guides, but we have reached out to Mazda for confirmation on the fate of the manual and the below reported prices. We’ll update this story if we hear back. That earlier reference to “2019” might have been a little confusing, since we’re already three months into the year and carmakers love to debut their vehicle models two years in advance. But the 2019 Mazda 6 isn’t out yet—refreshing, given the tendency for unnaturally early debuts. What isn’t refreshing is what it may lack. CarsDirect reports that Mazda will keep the option for either the standard 187-horsepower engine or a turbocharged 227-HP one for the 2019 model, but that there won’t be a choice when it comes to number of pedals: Every Mazda 6 trim will get a six-speed automatic, the story said, citing order guides. Fortunately, our analysis finds the car will gain more standard equipment that helps justify its higher MSRP. The most noteworthy change is that the entry-level Sport will now come with i-Activsense, which adds Smart Brake Support (auto emergency braking), lane-departure warning with lane-keeping assist, automatic headlights, and adaptive cruise control with stop & go. You’ll also get automatic headlights, rain-sensing wipers and a seat belt warning for front and rear passengers. All Mazda6 trims will also get G-Vectoring Control Plus, the latest version of the automaker’s enhanced handling system that you can also find in the new Mazda3. 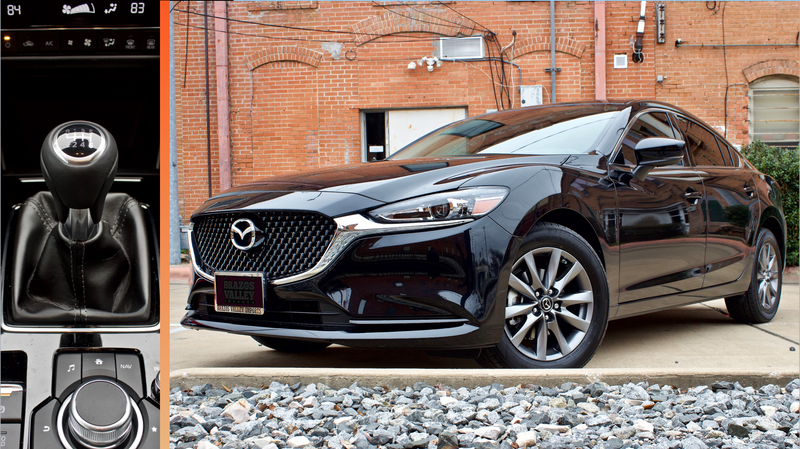 It’s a sad outcome, if it happens, since the manual Mazda 6 is a great value for a new car—even when compared to its significantly more expensive turbocharged superiors down the lineup. But it’s also understandable monetarily, given that both sedans and manuals are a hard sell anymore. That’s just how things are, no matter how hard they might be to accept. Less than 3 percent of new cars sold in the U.S. in 2016 had manual transmissions, the LA Times reported that year, compared to 7 percent in 2012 and 25 percent in 1992. Sedans are also suffering in the crossover craze. Putting those two together, while a bonus for car enthusiasts who don’t want a new car to shift for them, is a likely recipe for an extended stay on the lot. When a friend at a local Texas dealer offered to transfer a manual 2018 Mazda 6 into their inventory from a more highly populated area so we could compare it to the top turbo trim last year for a review, even, we told them there was no pressure to do it because we figured the model would be hard to move. So, welcome to 2019, where new Mazda 6 buyers may just have no choice but to pay more for fewer pedals. At least there’s always the used market, or the new Mazda 3.